Last quarter, UCLA/Getty students took the course “Conservation and Ethnography” (CAEM 222) taught by Prof. Ellen Pearlstein. The goal for the class was to acquaint students with the changing emphasis of conservation, from neutral acts based purely on material properties, to a series of humanistic and scientific decisions that consider the heritage source, its specific communities, the current and future roles for heritage, as well as evolving technical developments for both prevention and treatment. Through the examination and treatment of southern California basketry, students learned about these aspects of conservation as well as focused on the processes and properties of California (and neighboring) states’ native basketry, deterioration mechanisms and conservation treatment methods. In addition to treating southern California baskets from the collection of the Agua Caliente Cultural Museum and the Yosemite Museum, students were asked to imagine that in addition to creating their documentation for the next conservator, that they are creating it to assist Cahuilla weavers, ethnobotanists, revivalists, cultural descendants, or museum board and staff members in using their class project basket to answer questions and to promote culture. You can find links to the documentation they produced below. Categories: Conservation and Ethnography, Courses, Documentation, Treatment | Tags: basketry, California, ethnographic conservation, plant fibers | Permalink. In the spring of 2016, we had the opportunity to work on a collection of ancient Chinese bronze mirrors from the Ruth Chandler Williamson Gallery at Scripps College, in our course “Conservation Laboratory: Metals I (CAEM 234)” taught by Professor David Scott. I conserved a mirror dated from the T’ang period (618-907 CE) which was heavily encrusted with soil and calcite burial deposits (fig. 1). At first it seemed to be a classic example from that period, with eight lobes and decorated with birds, ribbons and flowers – nothing out of the ordinary. But an unusual feature emerged on the decorated surface during the cleaning process. Figure 1. T’ang period (618-907 CE) mirror before treatment. The decorated side of the mirror is covered with burial deposits such as soil and calcite. Gradually, a figure of a man, quite literally peeking out from behind one of the flowing ribbons, emerged from under the layers of sand and calcite – his hat, robe, shoes, and beard all visible (fig. 2). The figure was a complete surprise – clearly part of the original casting though in a completely different style and carefully rendered like a tiny line drawing (fig. 3). Amazed that the figure had popped out of the proverbial woodwork (or rather, metalwork), I went back to the x-radiograph taken before treatment, and even there, the figure was nearly invisible – due to a combination of the overall high opacity of the leaded bronze as well as several casting flaws within the metal which helped to obscure small surface variations. Figure 2. Detail of the area on the mirror where the figure was found. The search began for comparable examples, but so far, after conferring several experts and pouring over online catalogs at other museums, no similar examples have turned up. Figure 3. Drawing of the male figure found on the mirror. Portable XRF analysis so far indicates that the alloy is within the acceptable ratio of copper, tin and lead for the period. The analysis has also revealed traces of mercury on the mirror-side of the piece, a possible clue that the mirror had been ‘shined’ with tin and mercury – a (non-plating) technique referred to by Zhu Shoukang, He Tangkun, and Nigel Meeks in Metal Plating and Patination: Cultural, Technical and Historical Developments, 1993. Figure 4. Overly of the pXRF spectra collected from the decorated side of the mirror (red) and the mirror side (blue). Mercury (Hg) is present on mirror side but not the decorated side. (Data was collected using the Bruker Tracer SD-III for 900 seconds, at 40kV, 11μA, with a 1 mil Al/1 mil Ti/1 mil Cu filter). So far, the iconography of this mirror remains a mystery. It is possible it is a later replica made sometime after the T’ang period. With luck and further analysis, the mystery of the “Man in the Mirror” can be further illuminated. Categories: Conservation Lab: Metals I, Courses, Treatment | Permalink. …or more aptly titled “The trials and tribulations of how to set up this equipment and only get two seconds of a consolidation mist before it all goes wrong”. And no, that isn’t too much of an exaggeration. As useful as the application of a consolidant mist is for the treatment of powdery or unbound paint, we have found that the set up of the equipment can be difficult, and getting it to actually work can be hit or miss. There seem to be a lot of components to the systems—with connectors and tubing providing areas for leaks and many locations where things can go wrong. Though some images or diagrams in the literature describe the “proper” set up, it still seems that the systems are a little tricky to set up and do not always work consistently (if at all!). We recently set up these misting systems for a lab the conservation program students undertook on the consolidation of powdery paint for the course on the Deterioration and Conservation of Organic Materials III (CAEM241), and we thought it might be helpful to share how we set up our equipment, some of our discoveries along the way, and the issues we encountered. For those of you not familiar with this type of consolidation, in which the consolidant is atomized or aerosolized, it can be preferable to other methods of application because small quantities of consolidant can be applied as extremely fine particles in a controllable flow. This is especially helpful for paints that are unbound or underbound (such as matte, powdery paints often found on Oceanic and African artifacts), as it provides a low impact method of application. To achieve this, you can use an ultrasonic humidifier, aerosol generator, a nebulizer or some other type of equipment to create a mist that is then applied to the area of powdery paint you want to consolidate. Ultrasonic misting allows for very fine droplets (about 1-10 microns) to be delivered in an airstream saturated with solvent positioned close to the surface (therefore the solvent evaporates very minimally); this offers an advantage over pneumatic sprays, which may evaporate in the air before reaching the object, becoming too viscous to properly penetrate the paint (Michalski, et al. 1994). Problems that are usually associated with consolidation of powdery pigments (darkening, glossy appearance, smearing), are often due to the fact that too much consolidant is being used at concentrations that are too high, while ultrasonic misting can avoid both of these problems. Misting requires the use of very dilute solutions, allowing for a weak consolidant to be applied to a relatively broad area. This form of application also allows the treatment to be carefully assessed as it progresses, so that the consolidation may be stopped before any noticeable darkening or other alterations to the surface occurs. As we will see, the use of the ultrasonic humidifier, the nebulizer or the aerosol generator involves a relatively complex set up, which can create a number of challenges. If your lab is lucky enough to have something like the AGS 2000 HS aerosol generator from Lascaux, then you don’t have to worry about any kind of set up. This piece of equipment is ready to use and does not require additional equipment or components (or “jerry-rigging”). However, the aerosol generator is expensive and it developed after conservators implemented alternative systems employing an ultrasonic humidifier or nebulizer to produce a mist for consolidation. For this particular class, we had the students work with the aerosol generator, but we also wanted them to use the other two systems since those would likely be the types they would encounter at other institutions or even have to set up themselves. 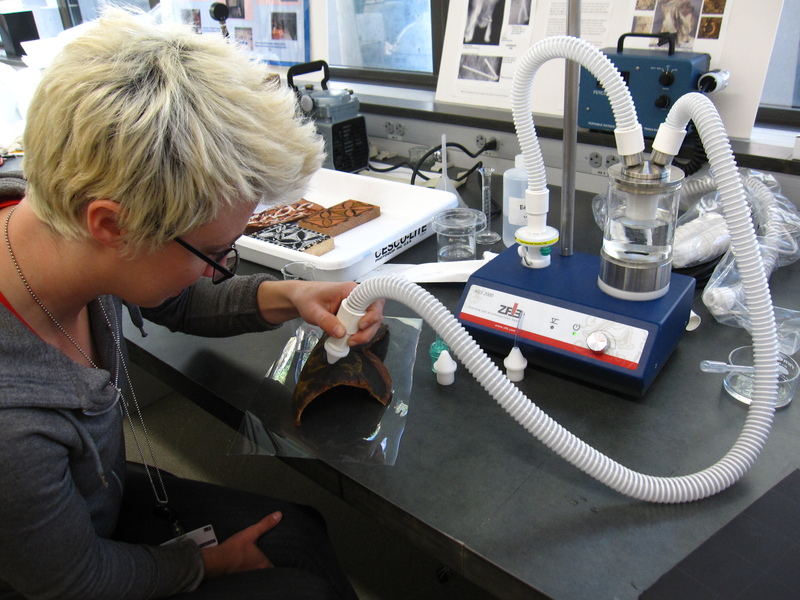 Elizabeth Drolet uses the aerosol generator to consolidate powdery paint. The first system we set up was with the ultrasonic humidifier. Luckily for us, there are some good published diagrams of how it needs to be assembled (Cavanaugh 2001 ; Dignard, et al. 1997). The system consists of an ultrasonic humidifier, an aquarium pump to provide pressurized air, an LDPE (low density polyethylene) bottle into which you place your consolidant, and tubing. This method is relatively inexpensive. You only need a household ultrasonic humidifier and an air pump or compressor. We used a small aquarium pump, the Optima Maxima A-806 pump with a rheostat, as our air source. We cut two holes into the LDPE bottle, as illustrated in the diagrams from the referenced articles, and inserted two pieces of tubing, held in place with EVA (ethylene vinyl acetate) low melt, hot glue. 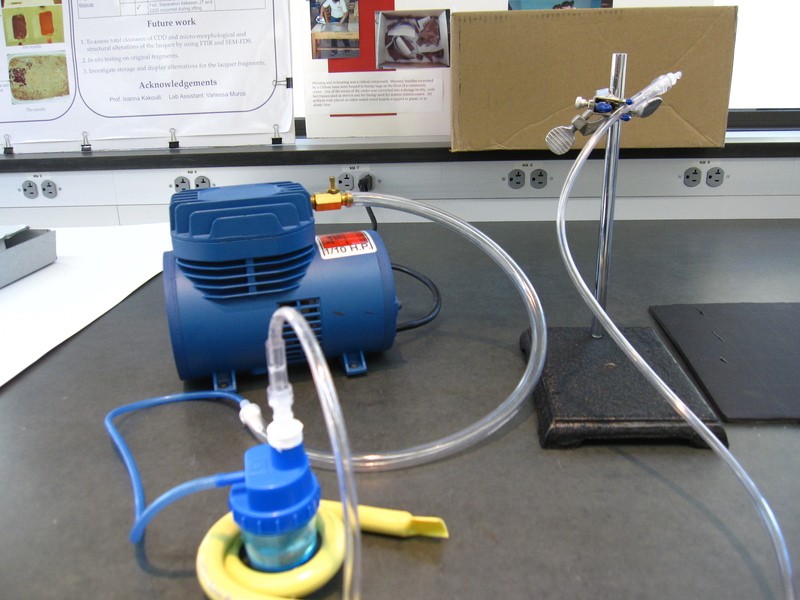 One piece of tubing was connected to the aquarium pump and the other piece of tubing acted as the nozzle for the delivery of the consolidant. We wanted to create a fine tip at the end of the delivery tube for the application of the consolidant, so we cut the end off of a plastic disposable pipette and inserted it over the end of the tubing. The LDPE bottle was positioned just above the oscillator of the humidifier and held in place using a small lab stand. We didn’t place the bottle directly on the oscillator because in the past contact with the oscillator caused the bottom of the bottle to melt. We then filled the humidifier reservoir with water. Now it was time to add our consolidant. For initial set up and testing of the system we just used deionized water to act as our trial “consolidant”. When we added our “consolidant” to the LDPE bottle, we made sure that the level of the trial “consolidant” did not go above the water level of the reservoir. So we set everything up, turned on the aquarium pump, then turned on the humidifier, and….SUCCESS!! We got mist! Okay, okay, it wasn’t that easy. We left out some of the problems we encountered with setting it up. We had two humidifiers in the lab: a Holmes brand ultrasonic humidifier and a Sunbeam ultrasonic humidifier that we use for the Preservation Pencil. For some reason we could not get the Sunbeam humidifier to produce a mist using this set up, even though it works as a humidifier. We aren’t really sure why this happened. We did notice when looking at the two humidifiers that the oscillator and surrounding plastic disc of the Sunbeam humidifier is smaller in diameter than the one in the Holmes humidifier (1.7cm in diameter as opposed to the 4cm oscillator and surrounding plastic disc on the Holmes humidifier). For now our theory is that the smaller Sunbeam humidifier’s oscillator is not powerful enough to produce a mist, but we aren’t exactly sure what is going on. If the consolidant delivery tube was too long, we did not seem to get any misting. We thought this could be because our aquarium pump was not powerful enough to push the air/mist through such a long tube. If the tube was too short, we would get more unwanted droplets of consolidant coming out of the nozzle, and in some cases these were pushed out of the tube with some force by the air pressure. The amount of air flowing through the tubing and the intensity of the oscillation also affected how much liquid consolidant was pushed through the end of the nozzle. We found that adjusting the rheostat on both the aquarium pump and the humidifier helped mitigate this. Feeling pretty confident from our successful set up of the ultrasonic humidifier, we started to work on putting together the nebulizer. It has fewer components to the system so we thought it should be a piece of cake—or not—as we were soon to learn. 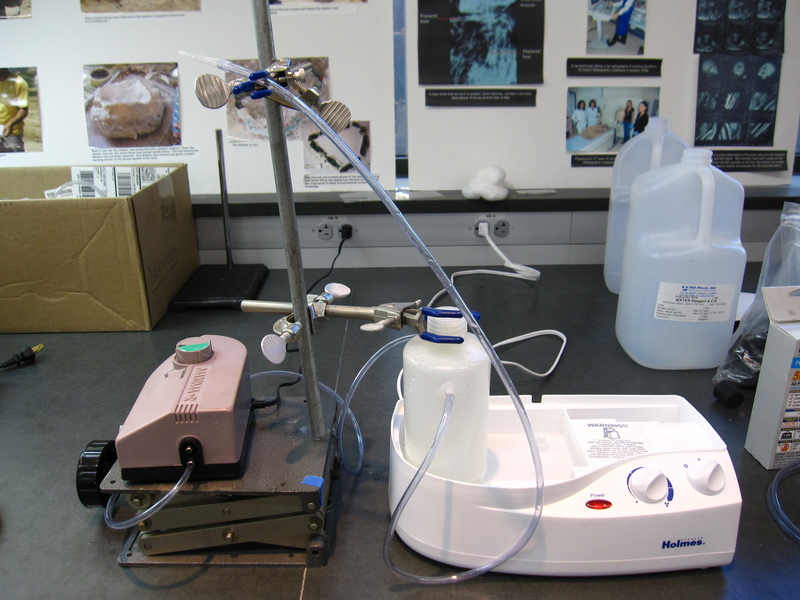 For the application of a nebulizer for consolidation, some treatments have involved the use of a medical nebulizer (Grantham and Cummings 2002) which again, like the aerosol generator, comes ready to use. In our case we were going to assemble our own nebulizer system using a nebulizer cup (which is where you place the consolidant) and a source of compressed air (using the aquarium pump). The nebulizer cups we bought have two openings: a side arm to attach the tubing for the air and a hole on the lid of the cup where we attach tubing to deliver the consolidant. We used some silicone tubing that came with the aquarium pump to connect the pump to the nebulizer’s side arm. 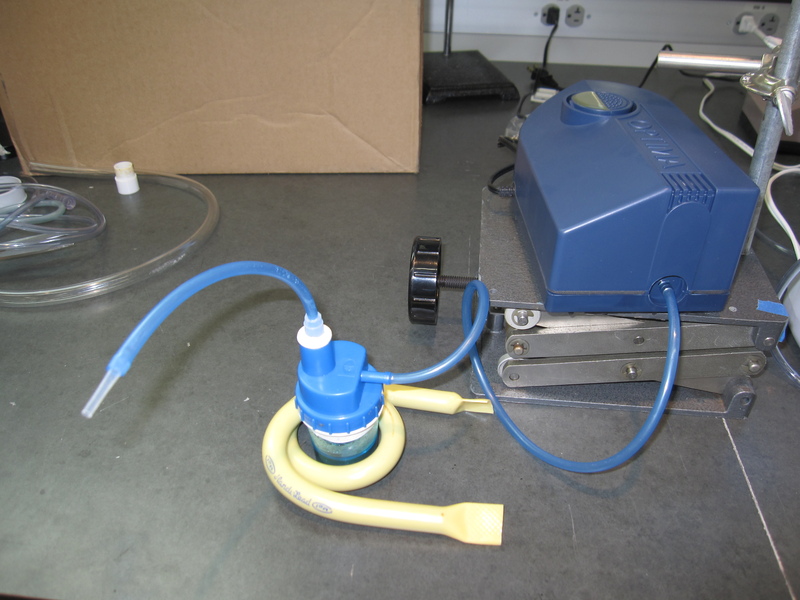 We then used clear tubing and attached it to the opening on the top of the nebulizer using polypropylene connector/reducer nozzles purchased from a lab supplier. We once again cut the tip off of a plastic disposable pipette and inserted it at the end of the tubing as our nozzle. With everything connected, we filled the nebulizer with water, turned on the aquarium pump and waited…and waited….and kept waiting…but there was no mist. We talked to a colleague (who had successfully used a nebulizer for mist consolidation) who said that we needed to make sure there were no air leaks anywhere. So we grabbed our Teflon tape and wrapped it everywhere there was a connection to ensure all the parts fit together tightly with no air leaks. She also mentioned that she filled the nebulizer cup half way with consolidant, which seemed to be the right amount to get the mist to form for her. So we filled our cups half way with deionized water, but still got nothing. We then noticed that the solution in the cup did not seem to be aerosolizing or moving much at all and we could only feel a small amount of air coming out of the tube. We wondered if this was caused by the length of the tubing we were using, like with the ultrasonic humidifier, but shortening or lengthening the tubing either from the pump to the nebulizer or for solvent delivery did not make a difference. Our next idea was that the aquarium pump we were using did not have enough pressure to produce a mist. The Optima Maxima A-806 pump works at a maximum pressure of 2.5 psi (pounds per square inch). We tried a compressor we had for our air brush which has an operating pressure of 20-40 psi. We connected the nebulizer to it, turned it on and immediately produced a mist! We noticed, however, that there was a very strong flow of air coming out of the delivery nozzle. When we tried to “consolidate” a facsimile with flaking paint, the air coming out of the nozzle blew the paint flakes off of the surface. The compressor seemed to be too powerful. This meant we had to find a compressor that was stronger than the small aquarium pump but not too strong to blow the fragile paint off the surface of an object. We settled on a slighter larger aquarium pump with a psi of 4 (the Optima Maxima pump A-407) and that seemed to work well in producing a mist. The nebulizer when attached to the air brush compressor produced too strong of an air flow which blew off flakes of paint from the facsimile tested. In addition to the difficulties with trying to find the right air compressor to produce the mist, we also had some issues with the length of the consolidant delivery tube. We wanted the tube length of the delivery nozzle to be long so we would not have to hold the nebulizer cup in our hand while conducting the treatment and instead could leave it on the table. However, we found that if the tube was too long, no mist was produced. Therefore, we had to settle for a shorter tube length for the delivery nozzle, which meant holding the nebulizer cup over or right next to the object while consolidating it. Cindy Lee Scott tries out the nebulilzer. 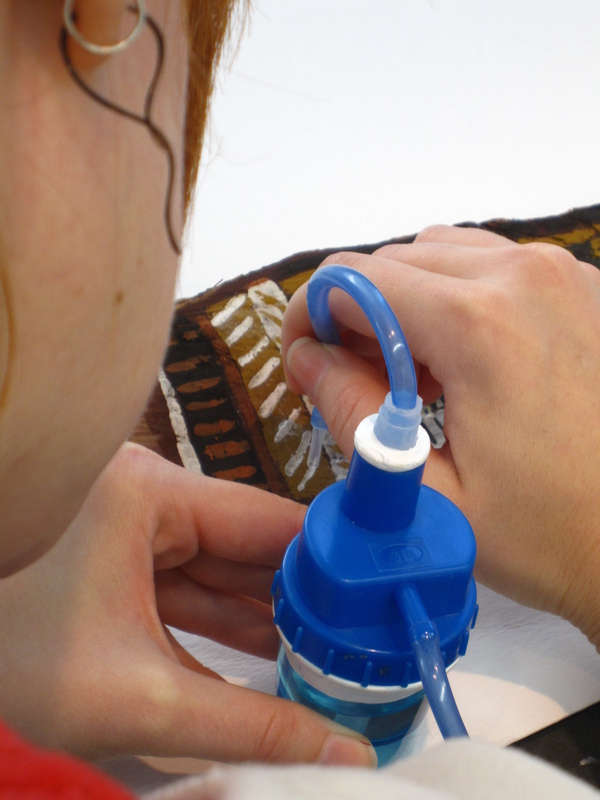 Because the tube for the delivery nozzle had to be short in order for the mist consolidation to work, the nebulizer cup had to be held close to the object (or over it) during treatment. After a couple of days of setting up and trying to get the nebulizer and ultrasonic humidifier to work successfully with water, we were ready to try the mist consolidation on facsimiles with powdery paint, using actual consolidants. Stay tuned for part II of this post, which will discuss how those treatments went and the issues we encountered. Cavanaugh, Jan. 2001. The Feasibility of Ultrasonic Misting as an Inpainting Technique. WAAC Newsletter. Vol. 23, No. 1 (January). Dignard, Carole, Robyn Douglas, Sherry Guild, Anne Maheux, and Wanda McWilliams. 1997. Ultrasonic Misting, Part 2, Treatment Applications. Journal of the American Institute for Conservation 36(2): 127-141. Grantham, S. and A. Cummings. 2002. “Painted Japanese paper screens: the consolidation of paint layers on a paper substrate. In The broad spectrum: studies in the materials, techniques, and conservation of color on paper, eds. H.K. Stratis and B. Salvesen. London: Archetype Publications. Michalski, Stefan, Carole Dignard, Lort van Handel, and David Arnold. 1994. 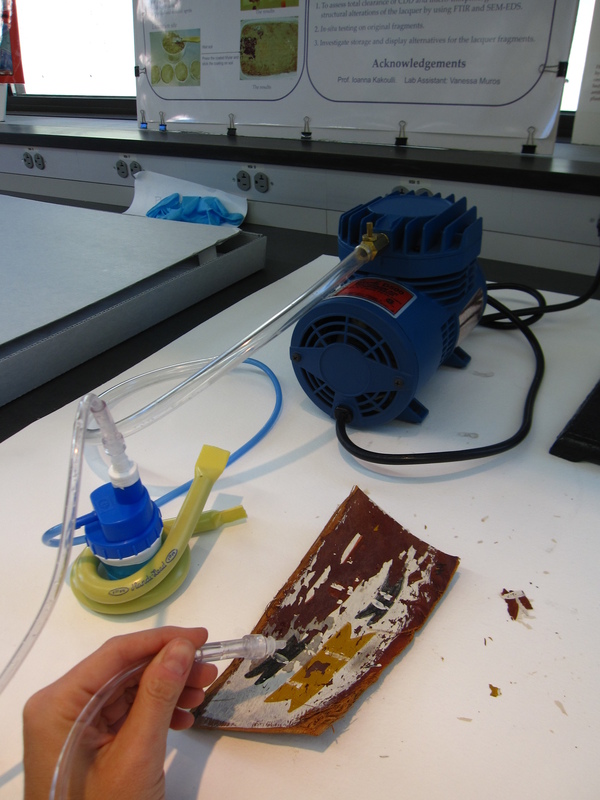 The Ultrasonic Mister: Applications in the Consolidation of Powdery Paint on Wooden Artifacts. 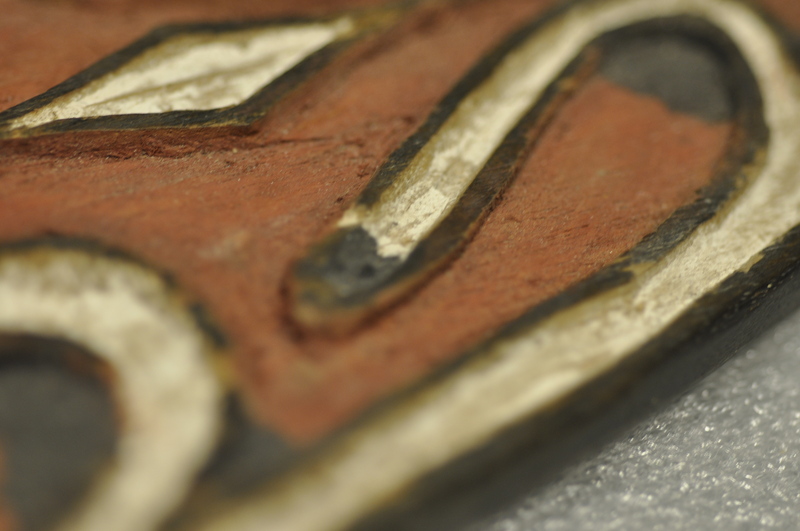 In Painted Wood: History and Conservation, Proceedings of a symposium organized by the Wooden Artifacts Group of the American Institute for Conservation of Historic and Artistic Works and the Foundation of the AIC, held at the Colonial Williamsburg Foundation, ed. V. Dorge and F. C. Howlett. Los Angeles: The Getty Conservation Institute, 1-18. Categories: Courses, Det. & Conservation of Organic Materials III, Treatment | Tags: aerosol generator, mist consolidation, nebulizer, powdery paint, ultrasonic humidifier | Permalink.